The egg supplier, Sparboe Farms, was also sent a warning letter earlier in the week by the FDA, which “found ‘serious violations’ after visiting five of the companies’ production facilities, including failure to have and implement a written Salmonella Enteritidis prevention plan and failure to prevent stray poultry, wild birds, cats and other animals from entering poultry houses.” Both PETA and The Humane Society have complained, and released videos of the inhumane treatment that occurs at these poultry facilities in years past. But, perhaps with huge corporations such as McDonalds and Target pulling their accounts from egg suppliers, like Sparboe Farms, other suppliers will take notice and not only set standards that conform with anti-cruelty laws; but will also keep an eye on their employees to ensure the treatment that cost Sparboe Farms the lucrative accounts of McDonalds and Target, does not take place at their egg supplying facilities. However, the treatment of these animals raised in factory farms, or in any business that’s bottom-line is to maximize profit, may say a lot about humans as a whole, not just the workers that directly mistreated the animals. Many of these workers take jobs in the industry out of desperation, or they are just uninformed about what exactly goes on within a factory farm. A good portion of these workers are not from this country, and have a very limited amount of employment options. 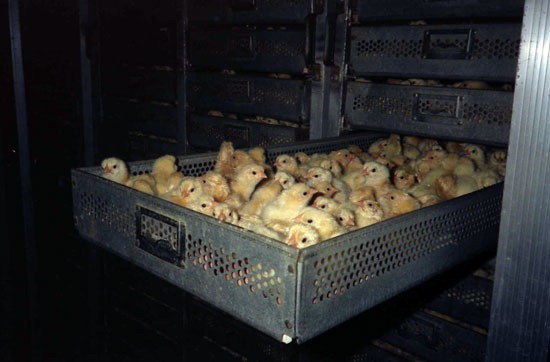 Factory farm workers look over tens of thousands of animals each day, and have to meet high production numbers, which could lead to some of the reasons they become highly insensitive to the animals well-being. Although it is easy to look at the horrendous acts of cruelty these workers have committed and say “I would never do that”, or that “They are just bad people”, but the truth is that there have been experiments about how sadistic people become when put in the position of a prison guard, and of course there’s the famous Milgram experiment. The workers who commit these acts and the corporations who employ the workers should both be punished. But, we should keep in mind: 1) Why these factory farms are in business in the first place, and 2) That most of us working in these conditions, and doing this type of work, over a long enough time period, could have been guilty of these horrible acts. I agree. Casting blame on the workers ignores the fact that anyone who eats factory farmed meat is complicit in the torture. I also think that any one of us working in those conditions could have been guilty of those acts. Even those of us who work in animal rescue can get numb to suffering! So in a situation where a horrific workload and conditions (due to profit before everything), combines with desperation and a systemic view of animals as commodity, no one is immune to this kind of thing. I’m always amazed that people are shocked by this stuff. So what’s the solution? You touch on it in your last paragraph. Get rid of the commodification of animals completely. Yeah, no factory farms. It’s the only way things like this will ever stop.